What is a Mushroom Grow Kit? A Mushroom Factory is a simple self contained indoor oyster mushroom growing kit. It comes with everything needed to grow gourmet Oyster Mushrooms at home. What do I need to do to make my mushrooms grow? All you need to do is follow the simple instructions on your Mushroom Factory; everything you need (except water) is included in your Mushroom Factory. Where should I keep my Mushroom Factory? The best location is a room where the temperature stays between 18-24 degrees, but a few degrees either way is OK too. You don’t need to keep your mushrooms in the dark, but keep them out of direct sunlight. What is the white stuff in the bag? The white substance in the bag is the mushroom mycelium. This is what your mushroom will fruit from. The instructions say water 2-3 times a day. How much is that? Technically you can’t over water your mushrooms but you could land up with a soggy box. Trysquirting 10-12 squirts each watering. On hot days try and squirt a little more often. Mushrooms tend to absorb a lot more moisture when they are growing so feel free to double up on the watering during this time. 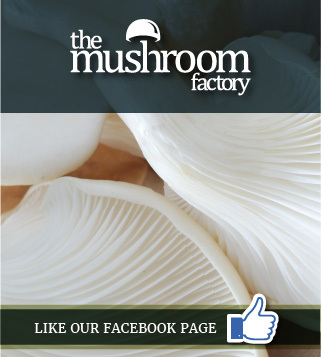 We absolutely guarantee our product, so if your kit isn't growing for any reason, please reach out to us: E-mail us at info@mushroomfactory.co.za and we'll send you a new kit– we try and stick to a 48 hour response policy on all e-mails we receive and make customer service our top priority. How do I know that my Mushroom Factory has not been contaminated with poisonous mushroom spore? Mushroom Factories are inoculated in very sterile conditions so the chances of other mushroom spore getting in are minimal. Poisonous mushrooms are generally saprophytic or parasitic needing very specific material to feed off. My Mushrooms look ready to eat, how do I pick them? From the time your mushrooms start growing, they should double in size every day. They will be ready to pick after about a week. Pick the mushrooms while the edges of the caps are still curled down. If you leave the mushrooms to grow bigger, you will end up with poorer quality mushrooms and it also means fewer mushrooms later on. Pick all the mushrooms at the same time by carefully twisting them off at the base. Don’t cut the mushrooms off at the base, this may cause make stump rot, and a rotten stump means fewer mushrooms on your next flush. NB: Once you have picked your first flush, keep on watering your mushroom factory. Your factory should produce between 2 and 4 flushes of mushrooms. Your most successful crops are usually the 1st and 2nd because this is when there are the most nutrients for the mushrooms to feed off. For More information, please refer to ‘Harvesting your Mushrooms’ on the website. I want to give a mushroom kit as a gift, but am concerned it won’t last. A Mushroom Factory is an excellent gift! Left unopened your Mushroom Factory can last up to one and a half months. I have just picked my last flush, what now? Our mushroom kits are RECYCLABLE! When your mushroom kit has finally exhausted itself, you can put the mushroom compost to work. Use the mushroom compost for potting your pot plants or mulching your flowerbed. How long before I get mushrooms? The first mushrooms are usually ready to be picked within 1-4 weeks of starting your kit. This of course depends on the conditions that you are keeping your Mushroom Factories in. Refer to ‘Growing Your Mushrooms’ on the website for the ideal conditions. Your second flush should appear 10-15 days after you pick your first flush, but can take as long as a month. Should I close my humidity bag at the top? No, you should leave your humidity bag open at the top as air circulation is very important for the growth of your Mushrooms. If however, if it is particularly hot you can peg the bag closed during the day, and open it at night. This is not recommended once your mushrooms have started growing as they will require more space and air. My kit grew a beautiful first crop but it’s been 2 weeks and no second harvest-what’s wrong? There is usually a 15-20 day break between flushes (sometimes longer, sometimes shorter, depending on temperatures). What we suggest you do is remove the bag from the box and give it a gentle shake. This will loosen up some of the spore. Then put the bag in the opposite way and make new holes. Keep watering and you should have your next flush in a few weeks.